Election Debates’ has scored the First Irish Leaders’ Debate of the 2011 election 2-0 to Micheal Martin. The debate between Eamon Gilmore (Labour) and Micheal Martin (Fianna Fail) was moderated by Vincent Browne of TV3 and saw both leaders clash over a range of issues including the economy, the deficit, the bank guarantee, the EU loan, health, education, public sector reform and parliamentary reform. Enda Kenny (Fine Gael) did not attend the debate. Notwithstanding his impressive performance, Mr Martin may be facing the same problem that former British Prime Minister Gordon Brown confronted during the UK debates – after so long in government, is anyone still listening? The public may have made up their mind. Indeed this may be Mr Martin’s thinking too, and may explain his combative nature. He debated like he had nothing to lose, and from a debating point at least, it worked. 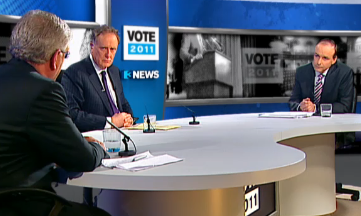 Election Debates’ Colm Flynn and Ray D’Cruz gave the debate to Martin.